Hi, everybody! Thank you for your encouraging comments and emails, and I will try to answer the questions that are either recorded here or that I can remember now that I have a working-and-online computer again, albeit without about a month’s worth of email. The dress is c. 1886, allowing for the fact that I designed it and am willing to dance about by a few years for the sake of theatrical ‘look’. 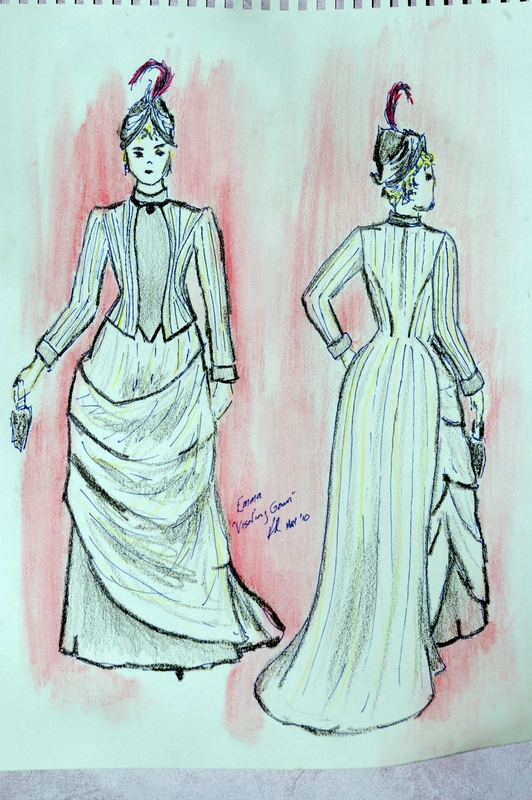 188﻿6 is my baseline, because what I am doing is costuming Jekyll & Hyde. In fact, the script direction I believe states 1888, but that is because I suspect the people who wrote the play didn’t actually read the book or, if they did, still chose to base the show off of a John Barrymore film from 1920, which was perhaps even more relevantly re-made for television in 1980. These scripts, unlike the original novel, have girls in them. is for Jekyll’s girlfriend Emma, who is rich and fancy and hence gets all the tailored and simple-looking stuff. Personally I am looking forward to the hookers, although Emma’s wedding dress will also be fun. For the first time, I begin to understand what was going through the designer’s mind when that garish monstrosity that was Lucy’s wedding dress in Bram Stoker’s Dracula was conceived. Although Emma’s will look nothing like that, I promise. Oh, and that is a bonnet on the top, there. As far as how I do this stuff – yes, Kate, I mostly drape. I’ve had dress-forms available to me since I started doing serious costuming back in high school, and I love draping because the hands-on and the literal creation of the shapes before one’s very eyes are to me incredibly cool. In fact, the incredible coolness of making wild and complicated shapes happen out of things which often used to be old sheets is pretty much why I do this stuff. I’ve been doing it for a very long time, and so actually I find I can now do most of the draping in my head and then go draw the shapes on paper somewhere, and I am actually doing that more for this show in the interests of having paper record and actual extant patterns when I’m done – but it isn’t as much fun as just throwing stuff at a dress-form and watching it become. I am even doing workup sketches, in order to prove (to no-one in particular) that yes, I really meant it like that. It is a front closure, but the real closure is hidden beneath that front panel, the buttons are all fakes although some of them conceal hooks that hold the panel in place. Under the panel is one of those nifty corset-closure metal button thingies. 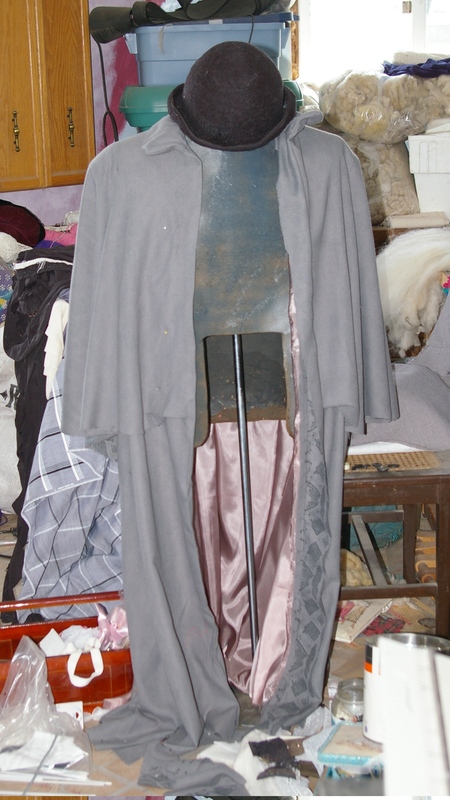 There will also be (when I feel like boring myself that much) a lot of little hooks or possibly for the sake of dressers snaps, which hold the train of the bodice in place over the train of the skirt, which is only pretty in the front because it has the bodice drape to cover it. This is, as anybody who isn’t bored rigid by now knows, also ‘period’, and damned convenient when trying to save money for stage as well. There are going to be a lot of bedsheets in this show. Also for this show I am building the bustles into the underskirts, instead of actually making the poor actresses wear constructions of steel and lace, as I have done in the past. This is kind of a pain and also more expensive than just liberating steel strapping from a lumberyard, but it will make the costumes more re-usable without the theatre having to store awkward hardware. Unless the dry-cleaners melt them, which is a possibility as I don’t completely trust dry-cleaners who are faced with something weird. But frankly, that is not my problem right now. Anything else I have done so far is pretty boring, although I do have a coat for Hyde that is showing potential. And yesterday I started working on a dress for the Other Woman, Lucy, which will be Really Very Different from Emma’s stuff, so as soon as it looks like something other than a bedsheet tied to a pile of quilt batting, I will show you that too. Ok, maybe I will also give you the bedsheet-and-batting, but I didn’t take a picture of it last night, so not yet. Oh, one other thing – you can, as that picture only sort of shows, kn﻿it and felt a decent looking bowler hat. God, you amaze me. You are the *bomb*. When I get rich I’m gonna hire you to make my steampunk garb. Yeah! Yeah yeah yeah! I so want to play with steampunk… I mean I know, I AM, but in a more self-aware manner. With brass, and self-conscious fabric printing. And maybe gratuitious pockets. (Men around me seem drawn to the “gentleman adventurer” look.) Also I am embarrassed to be seen in public with Raven’s tatty old frock coat, and need to make him a new one badly!! It has been indicated that maybe in a year or so I will get to do an Oscar Wilde in Steampunk style. That has possibilities. Oooooooo! Oscar Wilde in Steampunk?!? How perfect! Not to mention Fun! I was wondering how you would handle the bustles. Built-in sounds like a *very* good plan.